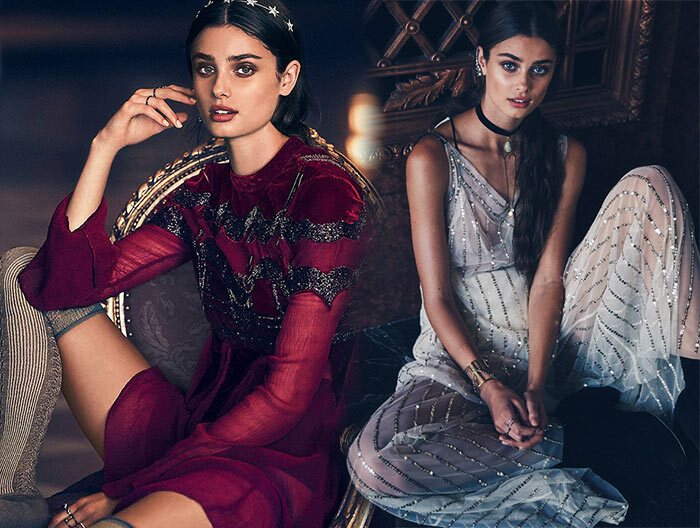 Free People has finally launched its official November 2015 catalogue, which features romantic settings and one of Victoria’s Secret new Angels: Taylor Marie Hill. The 19-year-old American model is thus the face of the ‘Moonlight Magic’ catalogue, one of the most bohemian Free People’s holiday lines ever created. What’s more you can already purchase your favorite cocktail look on Free People’s website, getting ready for the festive season in advance! While October’s issue focused on a more country-chic style, Free People’s November 2015 collection channels both an elegant boho-chic style and a few evening looks, which at times seem to be mixing a Roaring Twenties theme with a more contemporary style. Of course, we are head over heels in love with those ballerina-inspired Christmas looks that will turn anyone into the dreamiest creature these holidays. Despite being so young, Hill can boast a long experience in the fashion industry, which includes quite a few prestigious collaborations. Discovered when she was just 14 years old, Hill has ever since then walked the runways for Emporio Armani, Dolce & Gabbana, Vivienne Westwood and Chanel, and has been selected as 2015’s most promising model by Couturesque magazine. She has also been featured in the Intimissimi 2013 catalogue, which is probably why she looks so natural while posing for the Free People Moonlight Magic issue. This month’s stunning editorial covers fashion at 360 degrees, embracing this fall’s trends regarding both the clothes and beauty. Like a true diva, Taylor Hill shares beauty inspirations as well, alternating some sophisticated updos with more free-spirited undone waves, the delicacy of which is enhanced by a sheer smokey eye makeup. Hill’s dreamy silhouette perfectly combines the catalogue’s magic mood, which directly takes inspiration from the moon. The bohemian muse shows off both sides of the Earth’s satellite, proving her young age doesn’t get in the way of her career. The darker side of the moon is represented by long tunics, adorned with rows of sequins and sparkling glitters. Such rows of sequins have also been also used to embellish festive tank tops and floral embroideries. On the other hand, the bright side of the moon is depicted through a handful of fluid maxi gowns and long-sleeve shirts, which come decorated with curious cut-outs. Most of the shirts have a flared line, which give the catalogue its indisputable bohemian attitude. Free People’s November issue has fun playing with contrasts, as proven by some denim military jackets and leather flats, which break the line-up’s fairy motif with a more casual look. Such contrasts are also to be seen in Free People’s champagne-colored cocktail dress, the embroidered top of which features a stunning plunging neckline, and the sheer long sleeved tunic dress, sensually decorated with black sequins patterns. Headbands, ear cuffs and crystal necklaces give this catalogue even more Magic, officially beginning Free People’s holiday season. Going wrong with such dreamy cocktail dresses and ethereal gowns is basically impossible.